The RC-3 is powerfully equipped yet conveniently housed in a compact pedal. 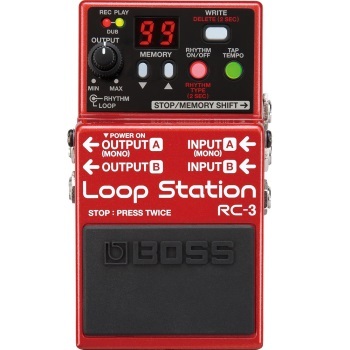 Enjoy up to three hours of stereo recording time, storage for 99 loops, a “real drums” rhythm guide, and USB 2.0 compatibility all in a small BOSS stompbox. Compact and powerful stereo stompbox looper. Massive internal memory with up to three hours of stereo recording time. 99 onboard memories for storing loops. USB 2.0 port allows you to connect to a PC and import/export WAV audio. Rhythm guide with real drums. Runs on a single 9-volt battery or optional AC power supply, which is not included.